Copyright © 2013 Maura O’Connor. All Rights Reserved. Front Cover Photos Courtesy of Noreen O’Connor. This book would not have been possible without her. Rear Cover Painting by Deborah Vinograd. Cover Design by Brace Isaacson. Some of these poems first appeared in Bull Horn, Neon Geyser Porcelain Sky, Oxygen, and other publications. The publisher would like to thank Mel C. Thompson for his support and work on an earlier version of this book. Maura O’Connor’s poetry is a flame cupped against a harsh wind. I want to tell you why this book matters. There’s the young poet shaken by AIDS, the child raised among yelling & hitting, the true love widowed and haunted, the descriptions of sanity collapsing in clear simple details. But none of these encompass Maura O’Connor, because these are not poems of madness, powerlessness, or sufferings for art. The exact opposite—her poetry is steady, strong and striving for life. This is a poet who has taken on the pain of those around her, seeking her redemption. She measures by her ability to stay true, turning empathy into a survival skill. In terrible circumstance, love abides in daily details, in girl scouts and prom night, the urgency of folding the towels in threes, playing tourist on Olvera Street. In this poetry, dreams become illusions become tragedies become memories of dreams. Dreams of China and children and a Catholic girl neighborhood and a life with someone she loves. It’s all vivid, and funny, and tragic, and real. The street people called her Little Red, for the hair, an Irish girl, generous, who would talk to you. But I need to tell you why this book matters. An unusual thing happened to Maura O’Connor. She fell. Fell into an underclass we normally don’t hear, perhaps because it is a voice of mutterings, chants and delusions. Unfortunately, these days, this sort of fall (from middle class, or otherwise) is no longer uncommon. But Maura O’Connor describes her feelings more clearly the harder and further she falls. She keeps an eyes-to-heaven perspective, while her voice remains plain, modest, beautiful in simplicity. It is a vision of everyday things—how a trip to the grocery entails terror, how a pet rat saves its owner, a beaten child saves a sibling, how love costs more than we can pay. And yet Maura insists completely on love. Writing this, the Superbowl chattering in the background, Maura’s poetry reminds me how each of our lives is a personal contest for survival, creation, destiny. These poems remind us how great is that contest within. Maura is speaking to America, too, and her Testimony goes straight to the heart. She speaks to us with familiarity, affection, respect. It is a clear warm voice, which can reach all of us traveling through the meat grinder of modern life. If these poems reach you, you will be changed. To read Maura’s book is to travel this mile in her shoes. To know the greatness of small victories, and devastating loss, too. When Maura’s poems reach you, you will know, by feeling, how limitless love rides shotgun to disaster. Maura O’Connor has written poetry from a young age. She showed up at the Cafe Babar around 1989, and her poetry brought a great deal of notice. 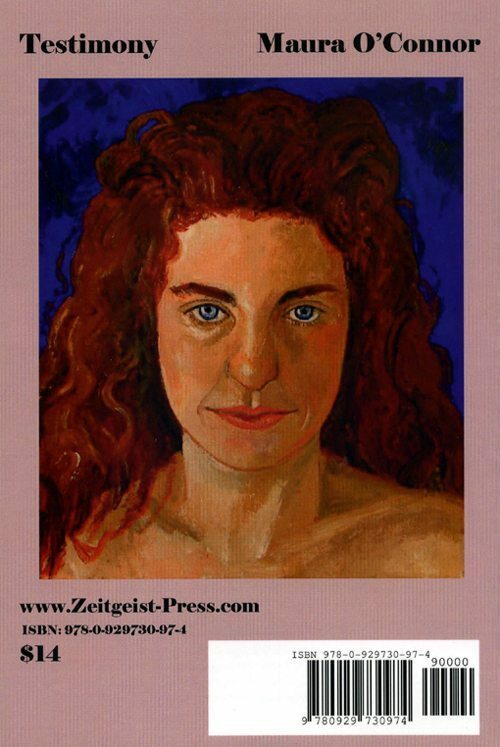 She was long associated with the poet David Lerner, who died in 1997. She published a previous book, The Hummingbird Graveyard, also from Zeitgeist Press. Her story is best told in her poems. 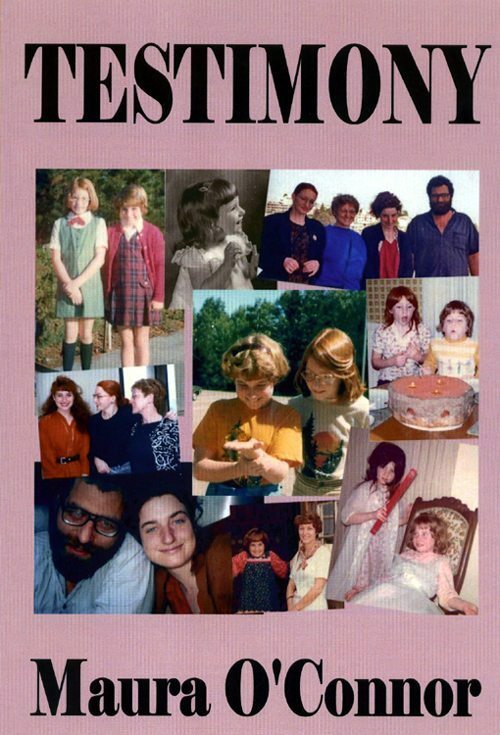 Buy Maura O’Connor – Testimony – Zeitgeist Press here. This entry was posted in Maura O'Connor and tagged Maura O'Connor, Poetry, Zeitgeist Press by Monsieur K.. Bookmark the permalink. to her head but touches us where it hurts and heals. I just read your poem Testimony at my poetry group last night. I loved the tension of clear seeing, the emotion and perseverance. Fresh and real, with visceral demand and elegance at the same time.